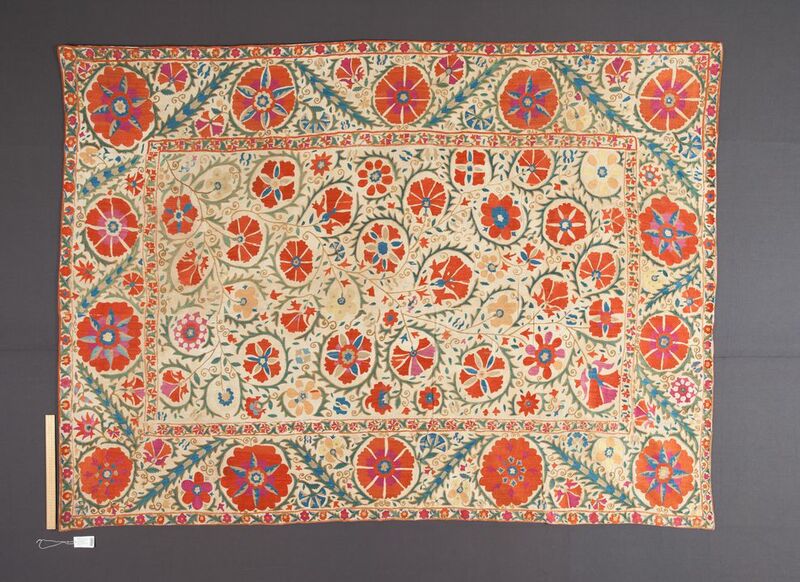 Made in Bukhara, Uzbekistan, c.1800. Hand embroidered hanging or bedcovering, rectangular, constructed from five long, narrow strips of plain weave natural cotton handsewn together along the vertical length. The large, central rectangular field is worked with a bold, trailing floral design that works up from the lower left corner and features differing flower heads embroidered in orange, crimson, blue, gold and beige with large pale jade green serrated leaves with leaf outlines and stems in olive brown silk embroidery threads using a variety of embroidery stitches, small floral motifs fill the ground between the larger flowers. Two narrow border bands are worked either side of the wide outer border are worked with small repeating floral sprays. The wide border band features large floral madallions separated by smaller trailing flower heads and diagonally worked serrated leaves. Small foil backed coloured glass beads have been randomly applied to some flower centres and stems, the beads are circular, crescent or star shaped with one cluster of miniature coloured glass bugle beads [possibly of a later date]. The entire textile has been backed with an evelope style, cream cotton backing with a wide strip of velcro applied along the upper edge. Inscribed, black ink at upper left and upper right corners, reverse, with dealers code `15226 tca'. Submit an image license enquiry. This object record is currently incomplete. Other information may exist in a non-digital form. The Museum continues to update and add new research to collection records. Let us know if you are interested in this object. Know more about this object? Have a question about this object?